Based on my own fieldwork, I will examine Andean indigenous religious rituals and folkloric contests of Cañaris in Northern Peru in order to unpack the terms in which their unequal relationships with the outside world are considered. I suggest that these Cañarenses rituals are particularly concerned with the label of poverty used by Peruvian society to depict them and that the invisibility of this indigenous society is in fact what allows this depiction. Rituals and contests are considered here as expressing an indigenous comment on the label of poverty used by the national state to describe ethnic groups. Despite of their remarkable cultural differences, the Cañaris should also be defined by its ‘invisibility’. As in other regions of Peru, little is known about these highlanders by the national and regional (they are certainly not even included in the formulation of their region’s identities) political centres of Peru, where the label of poverty is used as a way to continue ignoring their rights as an indigenous group. This label is built upon the fact that the Cañarenses, whose wealth mainly depends on land tenure, agriculture and reciprocal exchanges of labour and services, are not able to access the world of Peruvian national society as are those who have a highly monetised form of livelihood. I suggest that Cañarenses religious rituals and folkloric contests do not only express this interrelation of ‘poverty’ and invisibility, but also make a collective non-verbal reflection on it through two contrasting but complementary strategies. One is to perform a religious ritual in which land ownership and agricultural work are claimed as the most important sources of wealth. The other strategy is to perform a folkloric contest that claims monetary richness.¹ In sum, religious rituals and folkloric contests both allow Cañarenses to collectively enact and evaluate their invisibility and “poverty”. The religious ritual concerned here is the main annual celebration, linked to the most venerated statue kept in the main churches of the Cañarenses. The celebrations of each image are the responsibility of a specific land owner of the community. The main communities of the Cañarenses are Incahuasi and Cañaris. In Incahuasi, the same ritual is dedicated to ‘Our Lady of Mercy’, which is the most venerated image and substitutes the official male patron. In Cañaris, this ritual is dedicated to a male image, Saint John the Baptist, who is its eponymous and most venerated patron and is split into two images that have slightly different prerogatives and powers. Despite their differences, the participants in these both rituals reclaim the dependency of their livelihood to work on the land. This claim corresponds to one of the most important objectives of this ritual: improved land and cattle fertility. In Cañaris, Saint John is directly associated not only with healing but overall with water. Ritual participants devoutly moisten their hair and napes with the water taken from the marsh where Saint John turns around at dawn. They also bring this water to their land and give it to their animals. In Incahuasi, ritual participants leave fleece from their livestock after kneeling, praying, lighting a candle and giving a monetary donation to Our Lady of Mercy. Doing so, they assure the fertility and health of their animals. The dynamics and goals of these religious rituals intend to contest the label of poverty, which is viewed as the predominance (in a context in which commodities and money are increasingly important) of reciprocal exchange of services and products linked to agriculture over monetary payments and access to manufactured commodities. This correspondence between work on the land and the he stigmatisation as ‘poor’ (which in turn is used to deprive the Cañarenses of their rights to be consulted as indigenous people about the use of their lands by, for instance, multinational mining companies) is what is being debated by these religious rituals. Reacting to the association between land work, the externally ascribed label of poverty and the denying of their rights, these religious rituals claim land ownership and exchanges of labour and services as the most important sources of wealth, and reassert the need to increase the fertility of their land and livestock. In sum, if being poor is discursively labelled by the national society as being attached to the land, it is instead ritually claimed by the Cañarenses precisely as being deprived of it, as not having enough crops or enough cattle. There is still another local form of dealing with the label of poverty (and the fear of its consequences): the folkloric contests that take place at the same time and compete for almost the same scenarios used by the religious rituals described above.² Both in Incahuasi and Cañaris, the main annual religious ritual is accompanied by a folkloric festival that is independently organized by their municipal authorities using external funding. The ‘folkloric festival’ -called Inkawasi Takin– was created in the seventies by a group of rural school teachers, probably under a nationalistic ideology thatreacted against the influence of the nearby Republic of Ecuador. Today, its nationalism seems replaced by the promotion of urban music, quite different from the local indigenous music played during religious rituals. Later on (and until nowadays), this folkloric contest has been financially supported by the municipality. In contrast, religious rituals have never been funded by public money but by the wealth of specific families. Since its first edition, the folkloric festival has increased its participants, funding, and duration and has also been replicated by other communities of the Cañarenses. Nowadays, in the town of Cañaris, a similar folkloric festival is also organized by two externally-funded organizations: the municipality and a Catholic order, founded by a German priest (‘Misioneras de Jesús, verbo y víctima’), that is seen as linked to the foreign mining company interested in the region. It can be said that those who get involved in the folkloric contests in Cañaris and Incahuasi do so partially because of the monetary or commodity compensations offered by the organizers of these top-down initiatives. Nevertheless, participants are also seduced by being exposed to the modernity of the urban world, whose inaccessibility is one of the most feared aspects of the label of poverty. Let us now contrast religious rituals and folkloric contests among the Cañarenses. Firstly, the second ones follow an urban pattern taken from the cities in the lowlands, in which competitions on dancing, singing and playing are observed by a jury (and a public that does not vote but loudly show its particular support), while the first ones do not have neither a jury neither a public at its centre. In second place, folkloric contests make a constant and strong use of electrical devices, while religious rituals that have never resorted to any other devices apart from the local handmade musical instruments. Thirdly, while folkloric contests take place on just one main stage, the main phases of religious rituals happen in different places simultaneously or consecutively. In fourth place, if those farmers actively engaging in religious rituals are usually considered to correspond to the label of ‘poor’ used by national authorities and agencies, those who participate in folkloric contests are called the ‘rich’: those wealthy enough to move comfortably and frequently between the lowlands’ cities and the highlands’ indigenous communities, which enables them to establish businesses and to monopolise political power and funding attached to a municipality. In fifth place, those involved in rituals and contests actually belong to or support different key political organisations in the region. On the one hand, those who are directly involved in religious rituals are joined together in a group of land owners which is the main form of political organisation for indigenous people all over the Andes. On the other hand, those who participate in and support folkloric contests have the municipality as their economic and political axis. The municipality depends only on the external funding assigned to them by the national or regional governments, while the activities and power of the comunidad is mostly based on farming activities and on land tenure. These differences are taken into account by the members and supporters of each organisation and surely permeate the decisions concerning which one would be supported on what occasion. Nevertheless and in general terms, the municipality attracts those more interested in access to the urban world of the lowlands while the comunidad tends to join those whose income originates from land tenure. Finally, the simultaneity of religious rituals and folkloric contests acquires not only a sense of a tacit confrontation but also a meaning of explicit disregard between both groups. Once a year, contests spectators and ritual participants, ‘rich’ and ‘poor’, shop-keepers or wage-earners and peasants, dramatize what defines them and what distinguishes them; and they do it even occupying the same places. The religious ritual may occupy the side of the main square where the church is located. In contrast, the folkloric contest takes place next to the municipality. Even in marginal ritual places like those out of the main square, this confrontation and disregard seems to be the rule. For example, before, during and after the procession of Saint John in the marshes, the municipality organises football matches in a stadium located on the route taken by the participants in the ritual. I have intended to show how religious practices can express local views that respond to the way these communities are perceived in a broader society. Religious rituals (along with folkloric contests and precisely for what distinguishes from them) are then quite relevant not only for the study of indigenous cosmologies (as has been the usual case in the Andean studies) but also for issues like the confrontation over a multinational mining project to take place in the lands of Cañaris. 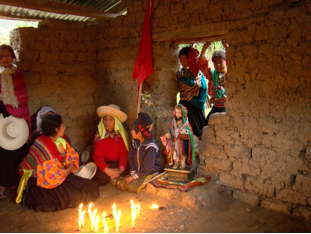 The study of religion among the indigenous societies of the Andes can help us understand phenomena like stigmatizations that do not only differ from the indigenous point of view but which legitimize sets of symbolic statements that tacitly undermine their participation in politics. Religious rituals here actually constitute non-verbal forms of dealing with such external identifications, ascribing their participants to specific symbolic strategies and situating them in a particular political and economic cartography which contends the national narratives on indigenous peoples. This analytical distinction between religious rituals and folkloric contests do not intend to make the argument that the former are connected to the more formal church structures while the latter are not. It is just a form to distinguish between some performances that are linked to an older agrarian structure that focus on the devotion of specific images kept inside a church (“religious rituals”) and other ones that are related to a newer monetized economy that focus on the public display of urban signs of status and wealth (“folkloric contest”). Before continuing, it might be worth more detail on the kind of perspective I am using here. This approach takes both folkloric contests and religious rituals as cultural scenarios where a group reflects on current issues that affect their society. Moreover, I propose that this reflection is made more collectively than individually, and more through embodied practices than narrative discourses.